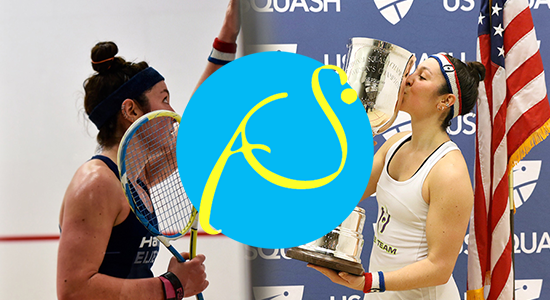 Nine months to the weekend after rupturing her Achilles tendon, Amanda Sobhy was back on court playing competitive squash in the WSDA Briggs Cup at the Apawamis Club in Rye, New York. Sobhy & Nikki Todd, a Canadian PSA professional and first-time WSDA competitor, entered the qualifying as the lowest seeded team in the tournament. Following two qualifying victories, Sobhy & Todd went on to upset 3/4 seeds Georgina Stoker & Amy Milanek in a three-game quarterfinal. The PSA pros then took out two seeds Narelle Krizek & Stephanie Hewitt in the semifinals 15-8, 15-10, 15-8, setting up a final with Tina Rix & Fernanda Rocha, who upset top seeds Meredeth Quick & Suzie Pierrepont in the quarters and 3/4 seeds Latasha Khan & Tehani Guruge in the semis. In the final, Sobhy & Todd earned a 2-0 lead winning the opening games 15-13, 15-11, but found themselves down 14-11 in the third. Sobhy & Todd then fought off four game balls, clinching the title 15-14. Sobhy gave plenty of credit to her Canadian teammate, Todd. The twenty-four-year-old from Sea Cliff, New York, was ranked as high as world No. 6 on the PSA Tour last season before her injury, and admitted it was a relief to be back on court again, even if a doubles court for now. The Harvard graduate is slated to compete on home turf in the WSDA Boston Open next month before making a proper return to the PSA Tour at the Tournament of Champions in New York City.